Animals can have as much difficulty identifying edible plants as much as humans. In the Boise, Idaho foothills a herd of 50 pronghorn antelope met untimely deaths after consuming a shrub used in residential landscaping. Wildlife officials believe the antelope encountered the shrubs known as Japanese Yew along a stretch of the Snake River that passes by several residences. While the shrub is a popular in landscaping, it’s fatally toxic to animals. A necropsy by Fish and Game wild veterinarian Dr. Mark Drew confirmed the leaves and branches were found in their digestive tract. 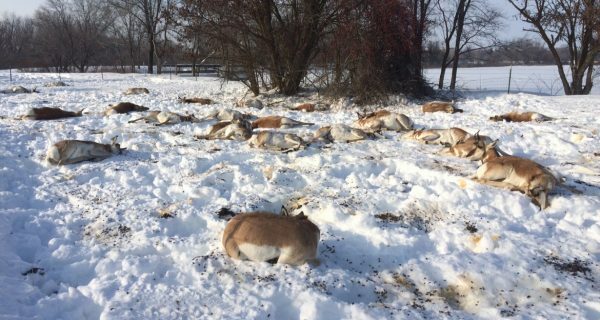 It was quite the scene when a local resident discovered 50 pronghorn antelope scattered dead in a large group, like the scene of a mass murder. Officials warned the public about this extremely toxic shrub, advising to inventory their properties and either remove it or cover it in burlap.